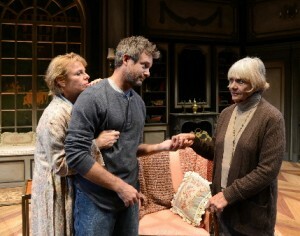 This week’s Wall Street Journal drama column is devoted in its entirety to Palm Beach Dramaworks’ revival of My Old Lady. Here’s an excerpt. “My Old Lady” is a three-hander whose plot is set in motion by Mathias (Tim Altmeyer), a failed American novelist with a weakness for drink who inherits a luxurious but crumbling Paris apartment from his otherwise indifferent father. The apartment, as he learns when he travels to France to sell it, has been occupied for the past half-century by two iron-willed Frenchwomen who haven’t the slightest intention of quitting the premises, a vinegary spinster named Chloé (Angelica Page) and her mother (Estelle Parsons), a worldly nonagenarian who is given to speaking her mind with alarming directness: “I’m 90. Subtlety is something that does not interest me.” It emerges that Mathilde, Chloé’s mother, was intimate with Mathias’ father, and that Mathias and Chloé are both unhappy and unfulfilled. Nothing especially surprising happens thereafter, any more than it does in a Mozart symphony. You know as soon as they meet that Mathias and Chloé will fall in love, and that Mathilde will do what she can to help them overcome the formidable conflicts of temperament that stand between them and the possibility of happiness. The magic of “My Old Lady” lies in the preternatural skill with which Mr. Horovitz propels his beautifully drawn characters toward what you trust will be their predestined fates…. The 87-year-old Ms. Parsons came to grief on Broadway last season in a poor play called “The Velocity of Autumn” that closed after 16 performances. Fortunately, that disaster did nothing to diminish her amazing energy and forcefulness. Watching her on stage in Florida, I couldn’t help wishing that New York audiences could see how authoritative she still is. But “My Old Lady” is not a one-woman show, and this production wouldn’t work nearly as well as it does were the other roles not so perfectly cast…. Though Mr. Horovitz recently turned “My Old Lady” into a film starring Kevin Kline and Maggie Smith, it’s more effective onstage, and this production underlines the play’s sadness without diluting the leavening touches of comedy that make it so satisfying…. In today’s Wall Street Journal “Sightings” column I touch on a seasonal theme. Here’s an excerpt. Christmas songs are beloved for all kinds of reasons, only some of which are related to their artistic merit. “Santa Claus Is Coming to Town,” which tops ASCAP’s annual list of the most frequently performed holiday songs, is irresistibly catchy, but it’s still a super-square piece of earwormy tinsel. If you love it, the reason is doubtless because the eupeptic lyrics remind you of the merry Christmases of your childhood (assuming that you had any). If, on the other hand, you’re a musician, your feelings about Christmas songs may reflect other, less immediately obvious priorities. I love “Winter Wonderland” because my mother sang it to me at bedtime, not because it contains a super-cool key change. Still, I wouldn’t be surprised to learn that I asked her to sing it every night because it changes keys, even though my five-year-old self didn’t yet know what that meant. This isn’t to say that we aren’t responsive to words. Jazz musicians, for instance, have a special place in their hearts for Dave Frishberg’s “The Difficult Season,” in part because Mr. Frishberg (who is himself a much-admired jazz singer and pianist) captures in his lyrics a feeling that most of us have had at one time or another: “We each have our reason for singing a lonely song/And every December, it seems, the blues is our only song.” But it also has a lovely tune, and the songs that musicians like best are usually the ones in which the music is as memorable and individual as the words. 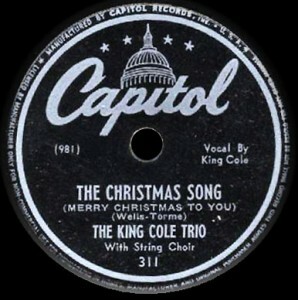 That’s why so many musicians are partial to a pair of holiday-themed songs that date from the mid-‘40s but remain eternally fresh. Ask a jazzman to play “Rudolph the Red-Nosed Reindeer” and you’re likely to get a freezingly fishy stare in return. But if you ask for “The Christmas Song” or “Have Yourself a Merry Little Christmas,” your request will be honored with genuine pleasure. Of all the Christmas songs written in the 20th century, those are the ones that in my experience are most commonly cited as favorites by professional musicians…. Edward Bulwer-Lytton, What Will He Do With It?